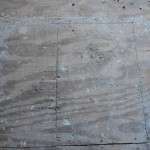 Kevin Rehberg chips away at the last of the original linoleum and glue in bath 3 upstairs, prepping the room for tile. 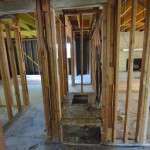 This may be the last demo we need to do inside the house at Emerald Hill. Milestone. The exterior of the kitchen wall as of 22 July 2015. 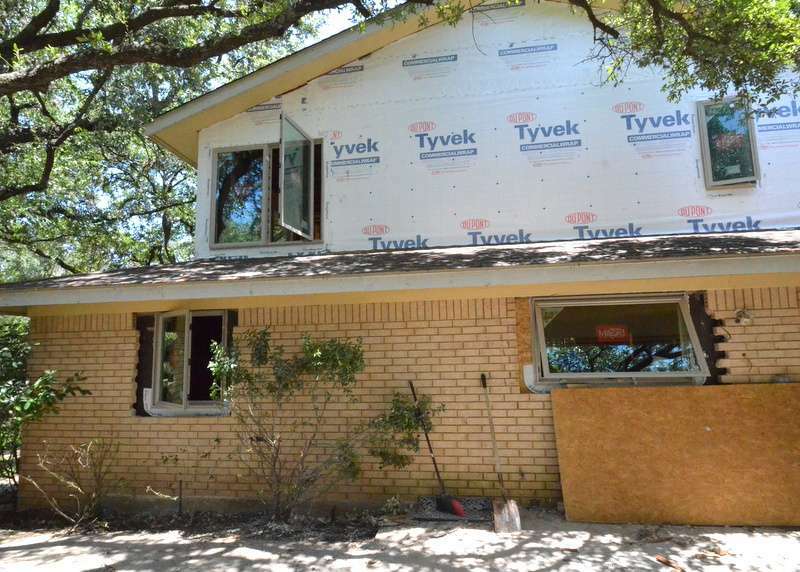 Yesterday, the brick exterior wall at the back of the kitchen was cut open for the new, larger window over the kitchen sink — and the original sliding glass door was still in place. 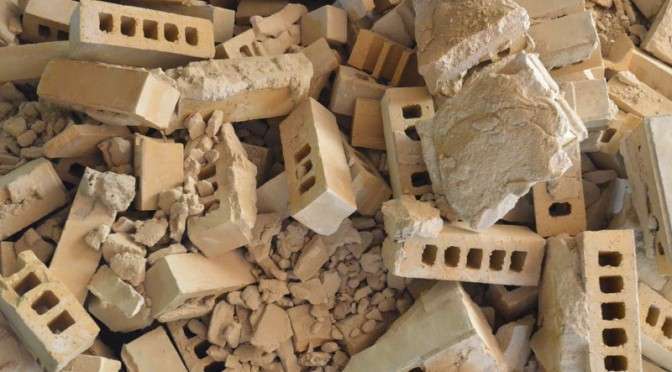 Same wall, 24 hours later. The new office window to the left, the new kitchen window to the right. 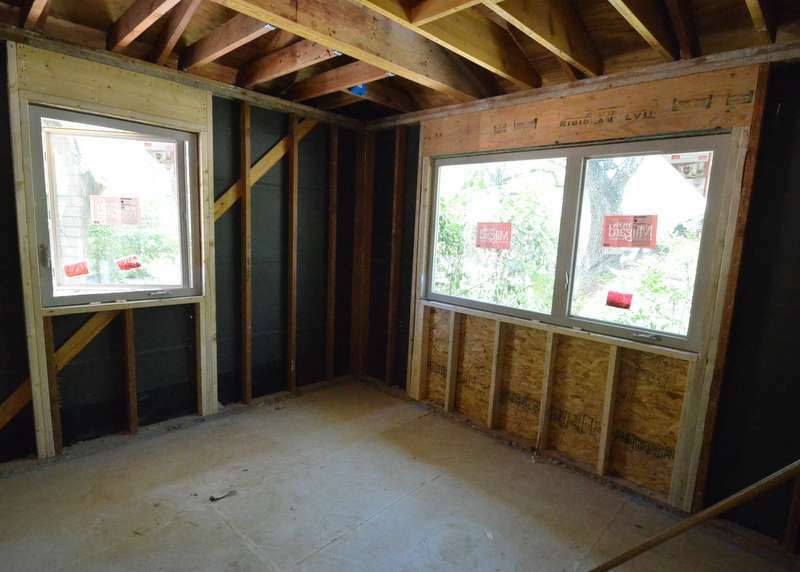 Today, the framing crew cut open the wall to add the new window to Steven’s office, and then mounted the new office and kitchen windows into place. New window on the left was a brick wall yesterday. Here’s the new window in the office, from inside the office. More light! 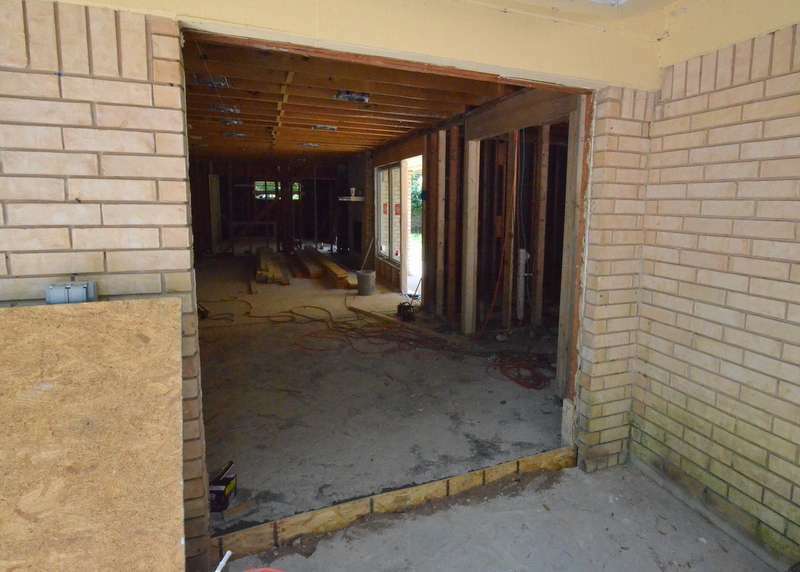 The sliding glass door is removed from the back wall of the kitchen, and concrete mixed to create a new footing. And the sliding glass door has been removed. The brick wall here will be extended to the right, toward the garage. 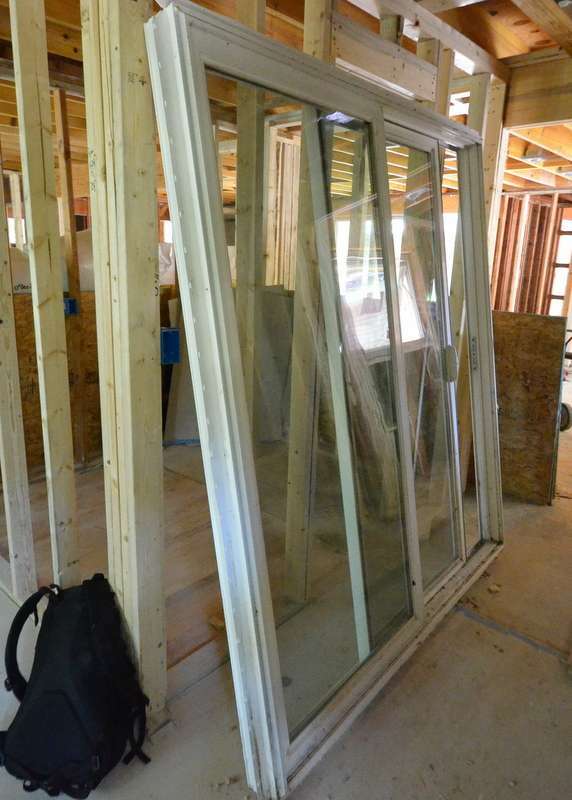 A new 36-inch wide exterior door will slot into the corner with the garage. The original sliding glass door from the kitchen. With Steven’s backpack sitting guard. 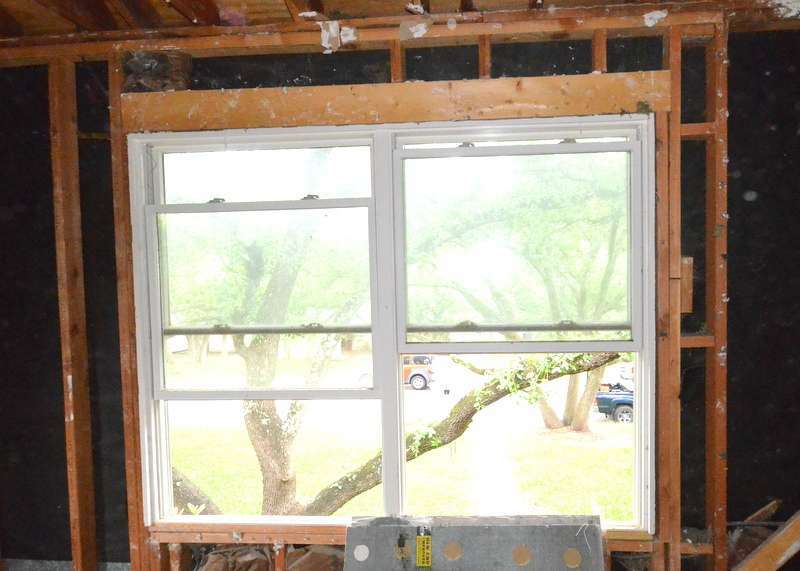 Here is the sliding glass door, removed, ready for donation to Habitat. 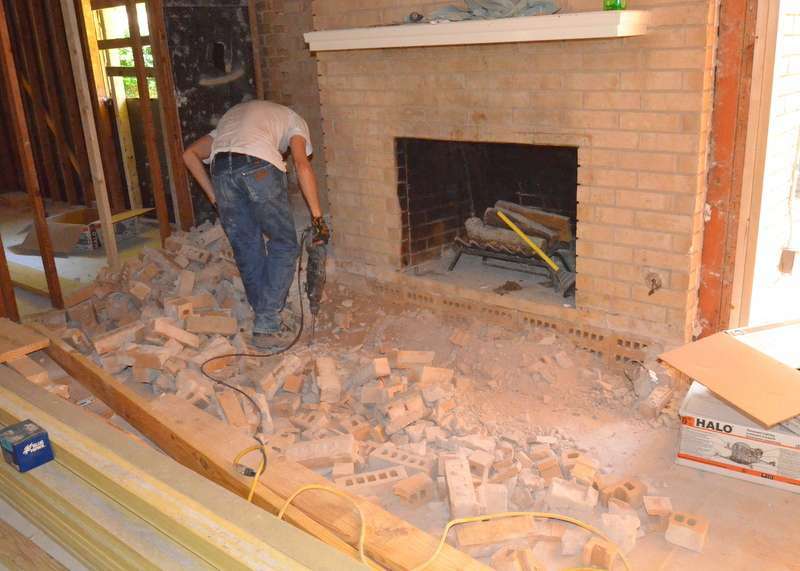 It’s time to get rid of the oversized brick hearth. Finally. It intrudes into the family room at shin height, sharp, oversized, imposing, sucking up room. 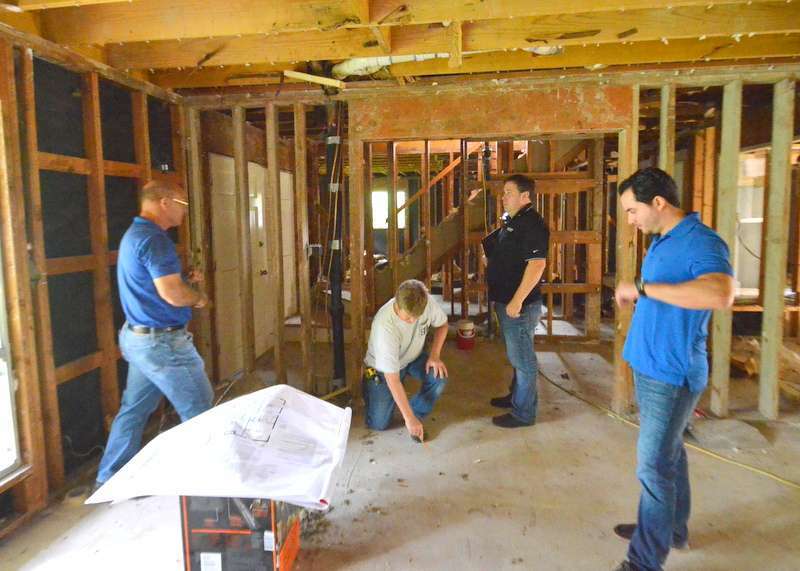 Kevin, son of Mark Rehberg, president of Ranserve, the builder, jackhammered it out. 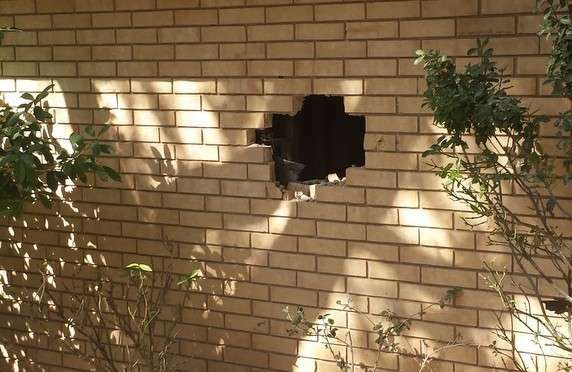 He saved the good brick for re-use at the new front entry. It’s Friday. Emerald Hill is quiet. 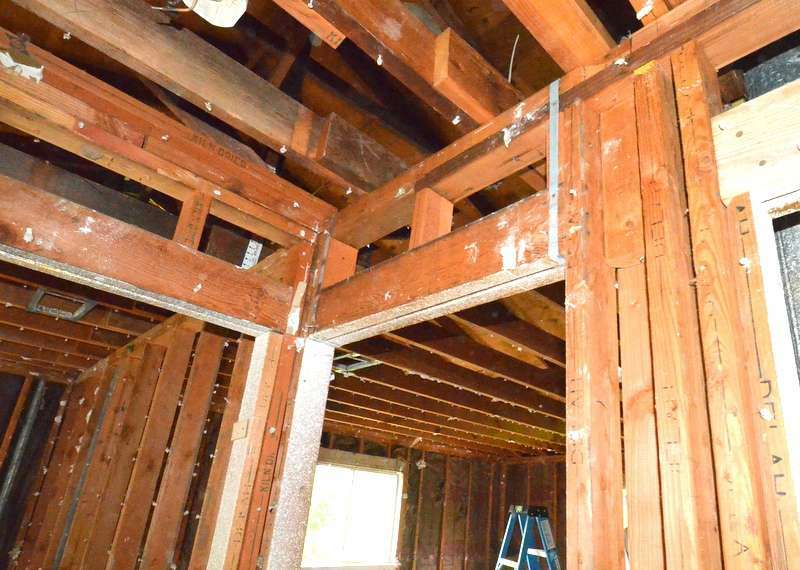 There’s no one working, because we can’t move forward without the framing plan from the structural engineer. Time is going to waste. 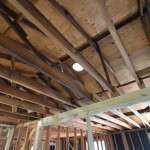 Barry at Custom Plumbing Services approved the plumbing selections, no changes, no additions. Kathleen at Ranserve alerted Jonell at Ferguson to start the order and delivery schedule. Jonell confirms and is also assembling the specification portfolios needed for construction and installation. Kyle at Elite Heating and Air Conditioning updated the Manual J to four tons at the request of Austin Energy Green Building. Steven forwarded the update to Miki at AEGB. Framing lumber is delivered to Emerald Hill. Steven is working through change orders 1, 2 and 3. 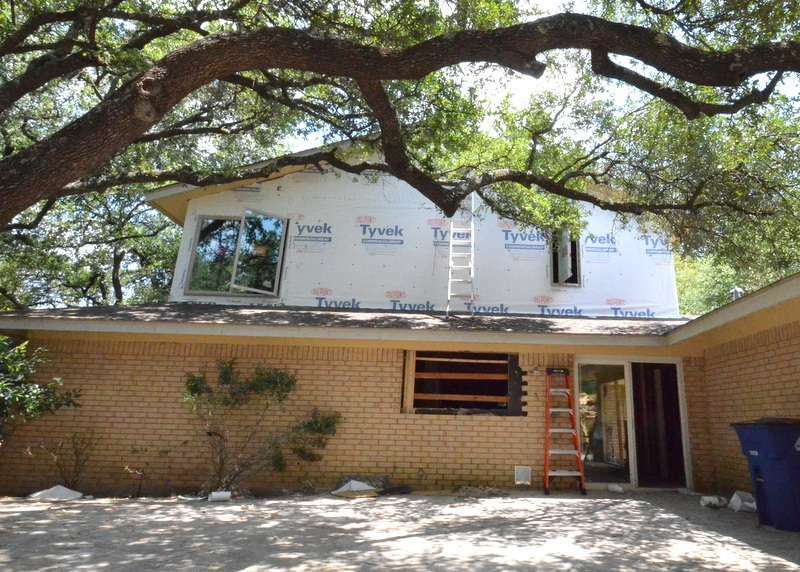 Mark from Ranserve, Brett the architect and Steven are scheduled to meet 1 July to review options for exterior siding — what reveal, smooth or cedarmill finish, mitered corners or not, vertical or horizontal. Steven and Jacquela promise a quick decision. The house across the street is sold. There’s a dumpster in the driveway. 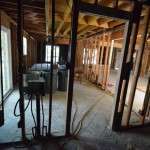 Looks like another remodel is underway. 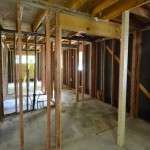 Here’s a photo tour of the house as of today. 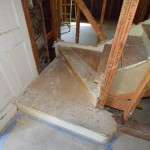 Ranserve is removing the oak treads from the stairs. 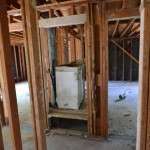 The HVAC air handler on the first floor is now removed for donation to Habitat. 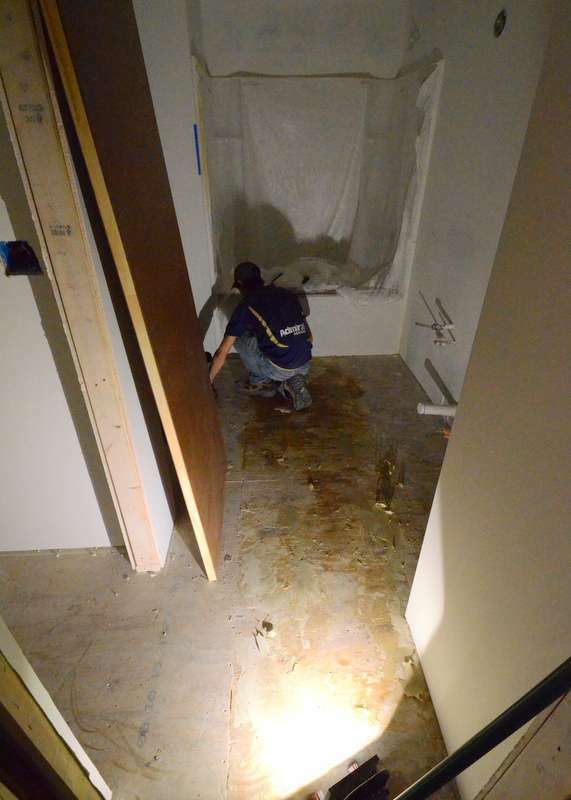 Tile floor of bath 2 is now removed. This is the northwest corner of bedroom 2 on the first floor. Demo reveals this is where water and gas services enter the house. 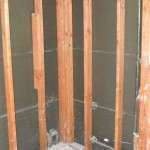 Water at left, cut off by the plumber. Gas at right, cut off outside the house during demo. 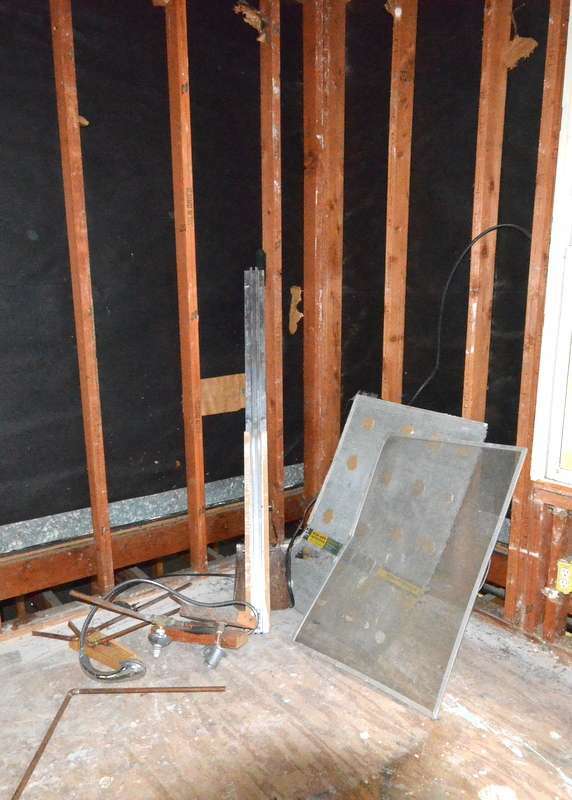 Pocket door into bathroom at what will be Jadin’s bedroom is removed, for donation to Habitat. Ranserve removed the kitchen tile floor. 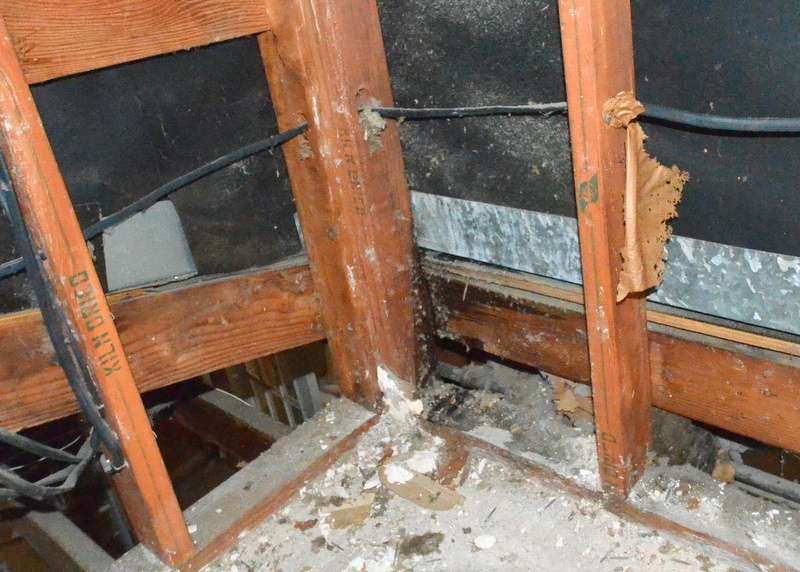 Another remodeling mystery. 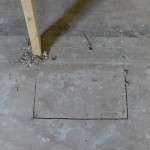 What was here that a former owner cut open the floor decking under the master, then screwed it back into place? With different screws? 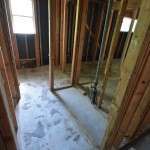 A remodeling mystery. 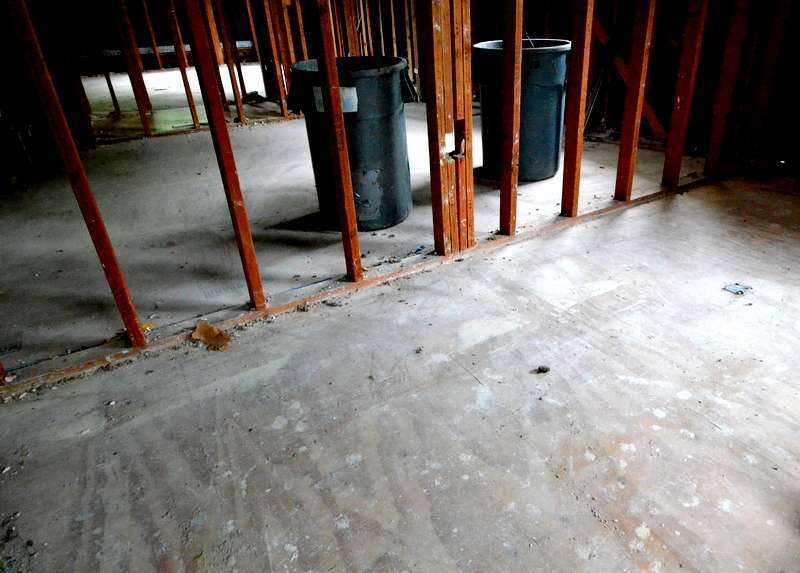 What was here that a previous owner cut the floor decking in the master bedroom? Attic and roof structure appears to be OK. 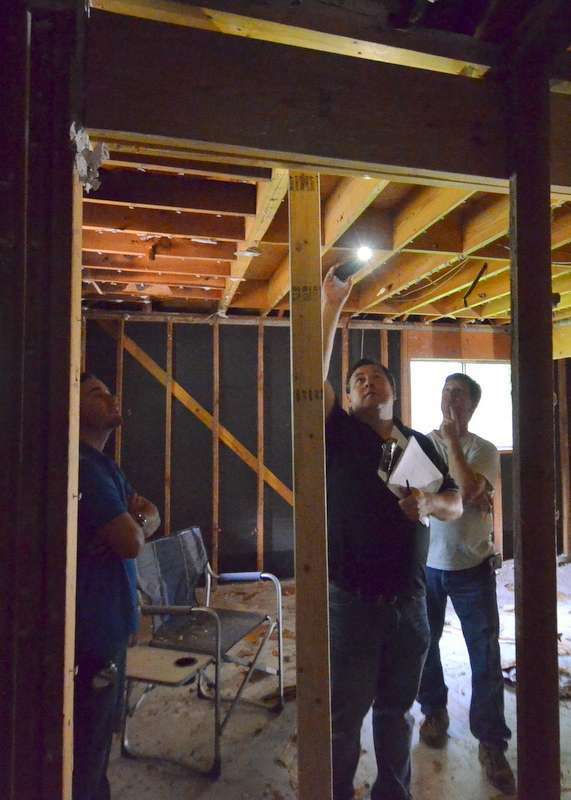 Experts will determine as we move into framing. This is the back of the chimney. Brick exposed where the roof rafters meet the top plate of the wall. And the tar-paper housewrap is dried out, crumbling. The upstairs air handler is removed for donation to Habitat. 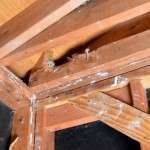 Looks like a critter chewed up the framing at the northwest corner of the roof, above what will become the loft. 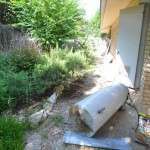 The 15-year-old water heater will be donated to Habitat and recycled. 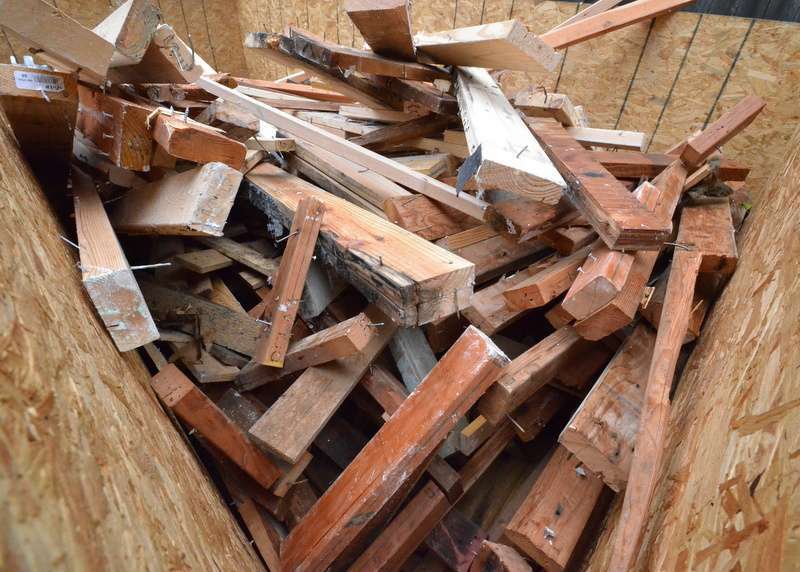 The pile of lumber collected, so far, for recycling per the Austin Energy Green Building program. 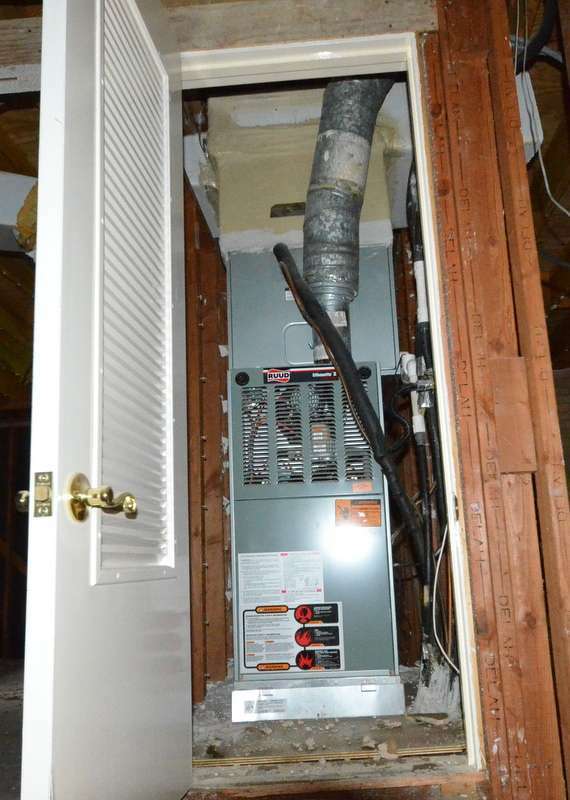 The downstairs HVAC air handler and furnace, soon to be decommissioned and donated to Habitat. 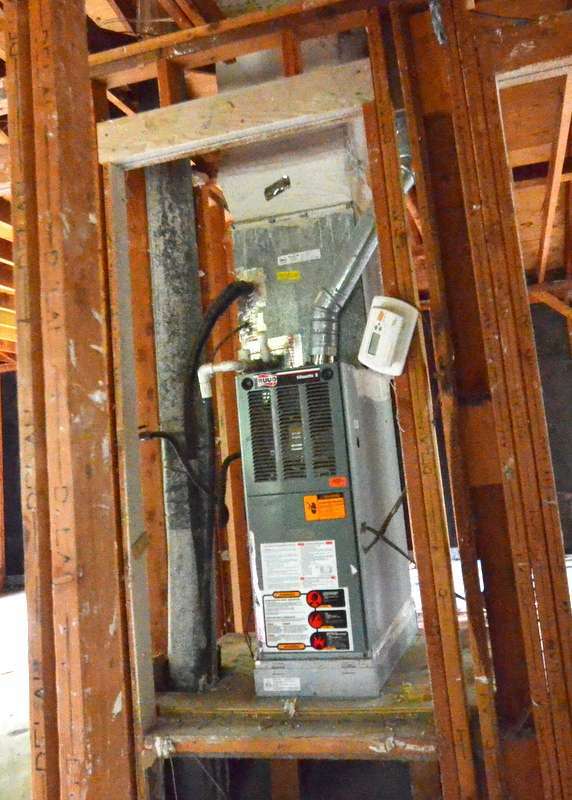 The upstairs HVAC air handler and furnace, also to be decommissioned soon and donated to Habitat. 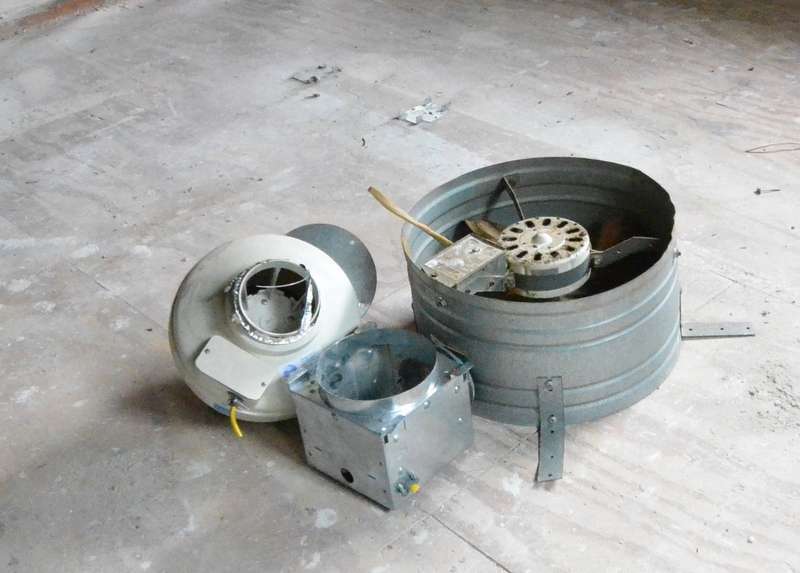 Bath exhaust fan parts and one of the just-discovered attic fans, to be donated to Habitat. 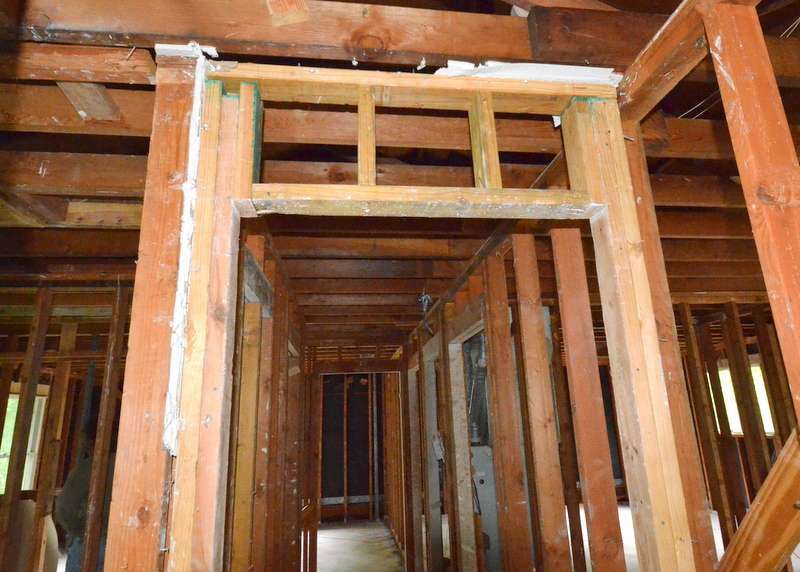 Ghost image of a former closet painted on the decking, closet removed by a previous homeowner in a previous remodel. Previous homeowner added this door in the upstairs hallway, to create a master suite when they combined two bedrooms. 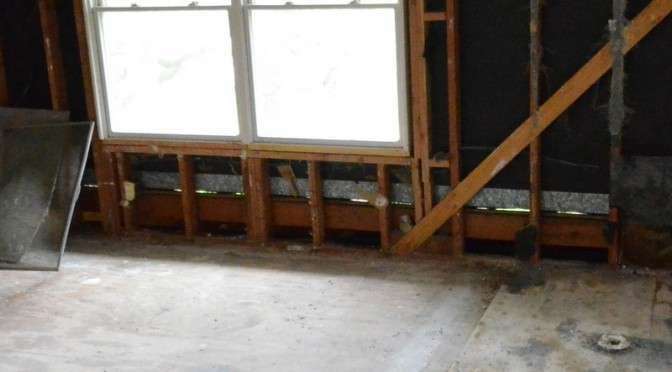 The framers did not remove the drywall; they just nailed over it. 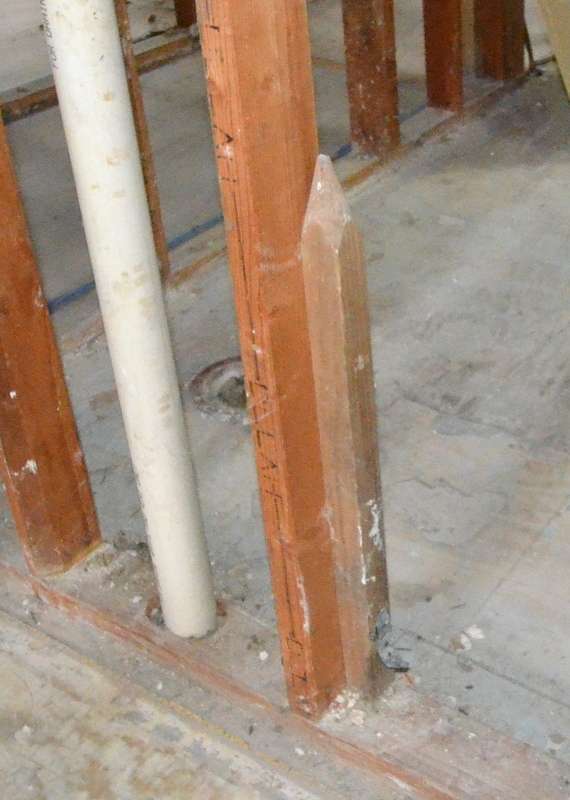 What is this oversized pencil in the wall between the kiddie bath and master bath? 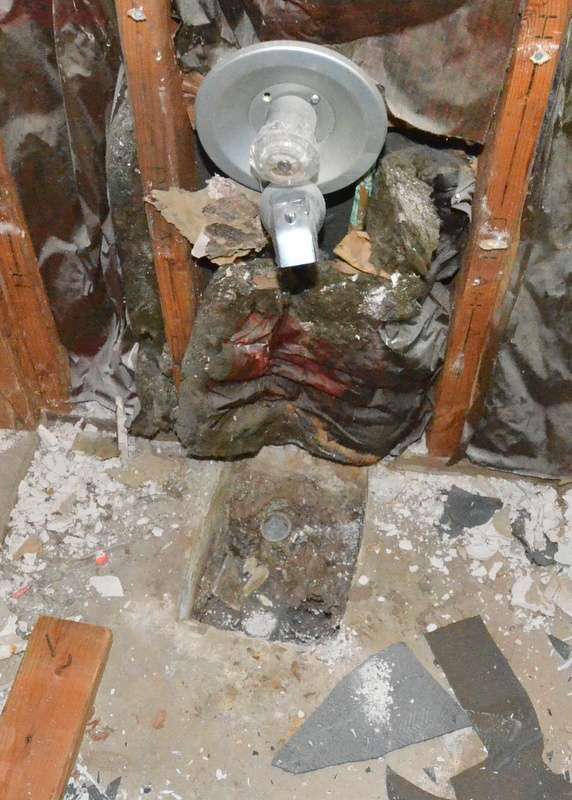 This was a door into a bathroom. 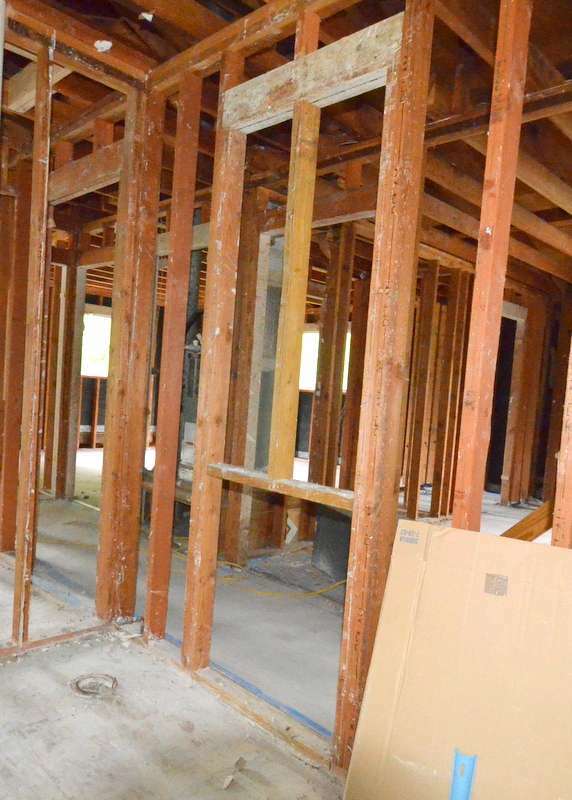 It was apparently taken out and the wall closed off in order to create a master bath. 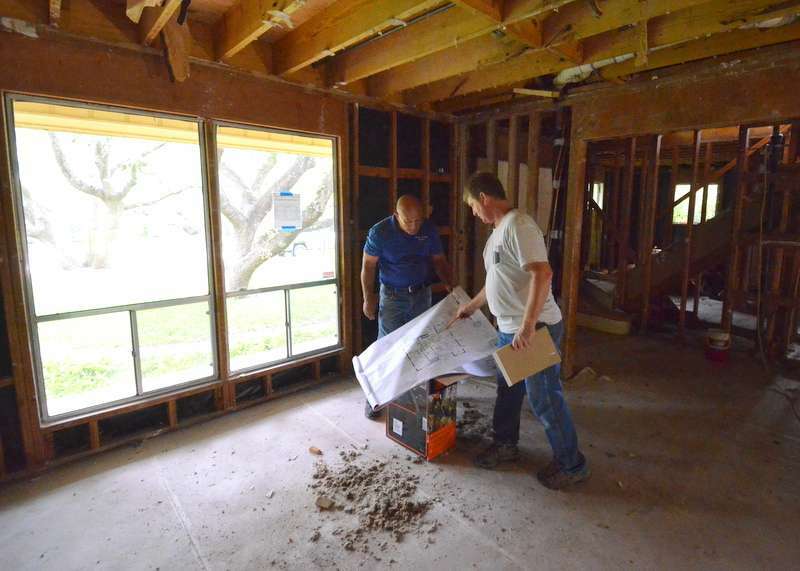 The irony is, Steven and Jacquela are putting a door at almost exactly this location, to create a laundry/utility room — we are again returning the house to its original footprint. 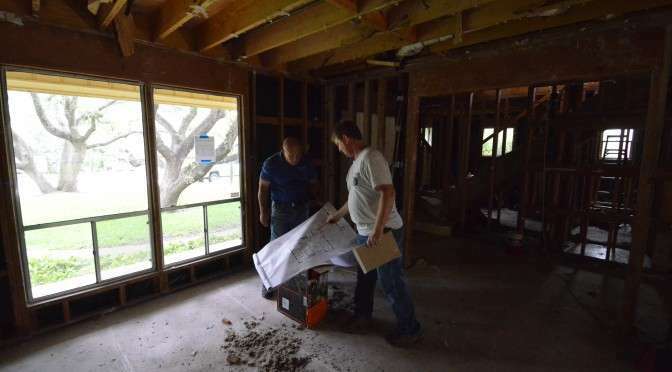 Mark Rehberg from Ranserve files this week’s update. 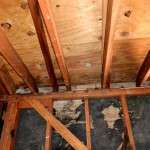 Confirm with second opinion that existing wood floors cannot be refinished. This is most likely the case. We had a productive week and may start framing next week.